I’ve been lucky enough to travel to Mallorca for a few summers now and every time is something special. Whether it’s a new restaurant, a new beach, a different kind of paella or just the perfect sunset while sipping on Campari, I consider Mallorca one of the most magical places on earth. Of course, this all has to do with the food, let’s be honest. I think everyone travels for different reasons and the things that make them happy when they are traveling range. For me, the goal of travel is to experience culture through food. I really think there is no better way to do it. Everything from a private home to fancy restaurants to tiny village restaurants to markets. Each has something glorious and beautiful to offer in its own special way. 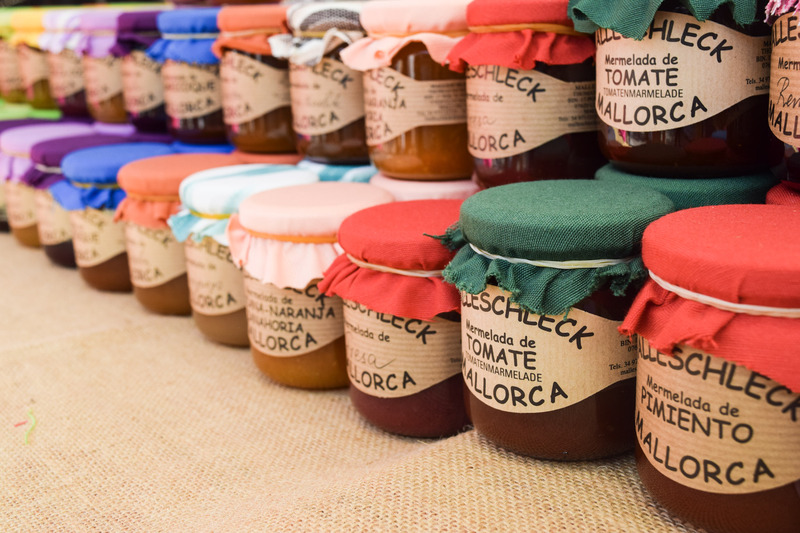 My favorite thing in Mallorca is the market. It’s simply gorgeous. If you’ve never been to a proper European market then, oh my goodness, you are missing on one of life’s most wonderful shows! Everyone selling their wares from fresh fish to wine to marmalade to produce. Beautiful breads are showcased, aromatic cheeses are sliced, tomatoes are cut in half for you to note their beauty and then purchase. The smells, the conversation, the sights are all so fun to absorb! I especially love the town elders all gossiping about the local happenings….it’s too funny! 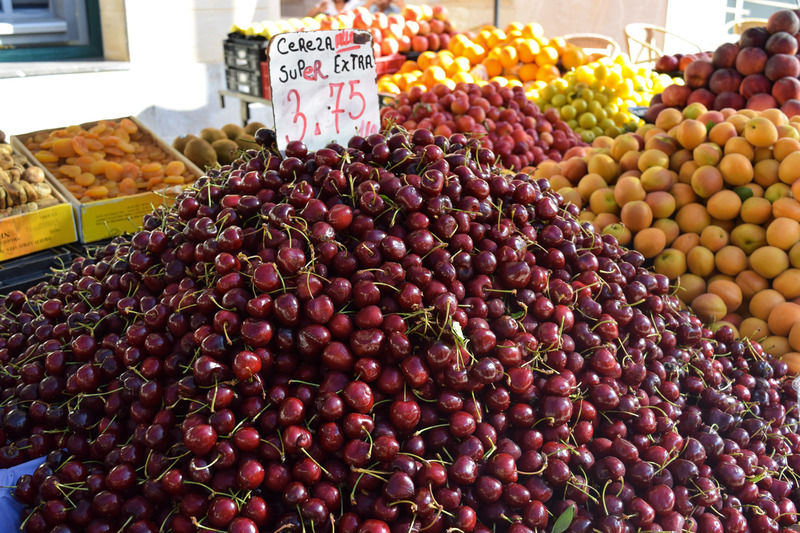 In Mallorca we go to the market for all of our produce. Every Saturday and Wednesday we plan our meals around whatever produce makes its way into our Spanish straw bags. Usually melon, peaches, apricots, salad, tomatoes, herbs, the most glorious prawns (almost neon in color! 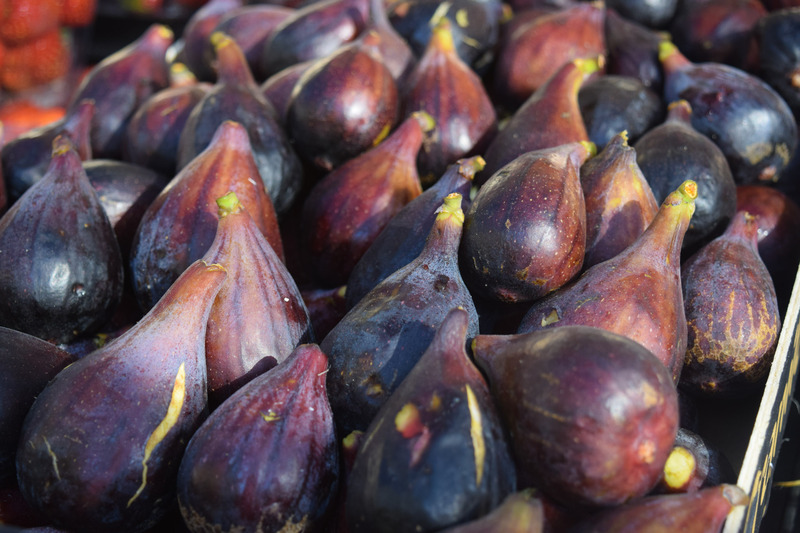 ), marcona almonds, honey…..the list continues. And every year there tends to be a “dish of the summer”. In the past it has been t omato and cheese toasts, caprese salad, crepes. 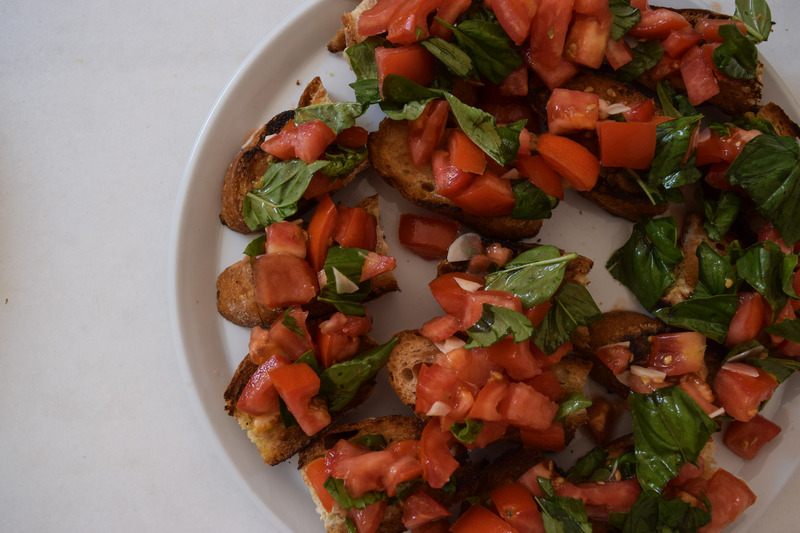 This year it was bruschetta, in all of it’s simple summer glory. Perfectly ripe tomatoes, christened by the Mallorca sun and then tossed with everything local: olive oil, sea salt, basil. Spoon this over olive oil drenched crispy baguette (mine was of course, gluten free) and you have the perfect summer lunch, snack or dinner. Tear the basil with your hands and toss into the bowl. Add the garlic, olive oil, salt and pepper and mix gently to combine. Slice the bread, preferably a crusty baguette, into 2″ slices. Drizzle generously with olive oil. Toast the bread in a pan on the stove until lightly browned on both sides. Spoon the tomatoes and juices over the baguette and enjoy! *to make gluten free: use your favorite gluten free baguette!